Premium Steaks – NY Strip, Tenderloin, Ribeye, T-bone, Flat Iron. We do not recommend marinating premium steaks as they tend to become mushy! Sirloin, Sirloin-Tip, and Flank Steaks can be marinated, but usually for no more than 1 hour. These steaks are best grilled or pan-seared in a hot skillet with only salt & pepper, or a rub. Get a cast iron skillet or grill HOT, add a little olive oil to the skillet just before adding the steaks. Sear both sides, then turn the heat down to cook the steak only until rare (120 degrees at center of steak). Remove steak from pan and let rest 10 minutes. Marinating “Economy” Steaks – Chuck Steak, London Broil, Eye of Round Steaks, Skirt, Flap, and Hangar Steaks. We recommend marinating steaks that are less tender. For safe handling, always marinate in the refrigerator. To tenderize these cuts, allow at least 6 hours, but no more than 24 hours (longer makes it mushy). Once you’ve marinated the steaks, – get a grill or cast iron skillet HOT and just before adding the steaks, coat the skillet with olive oil, sear the outside of the steaks, then turn the heat down to cook the steak only until rare (120 degrees at center of steak). Remove steak from pan and let rest 10 minutes. Skirt, flap and hangar are excellent to slice thinly for fajitas after grilling! Rare Roasts – For premium roasts like Top Round, Sirloin, Sirloin-Tip and Prime Rib roasts… When roasting, sear the beef first to lock in the juices. Alternately, rub the roast with olive oil and put it in a pre-heated 425 degree oven for 15 minutes. Then REDUCE the temperature to 350 degrees and cook until the meat registers 120 degrees in the center of the roast. Remove the roast from the oven and let it rest for 15 – 20 minutes. Use the pan juices to make a yorkshire pudding, sauce or Au Jus. Again . . . watch your meat thermometer and don’t overcook your meat. Braising and Pot Roasts – For traditional “pot” roasts like Bottom roasts, Briskets, Chuck Roasts, Eye of Round roasts or Shoulder Roasts, just follow your favorite recipe that will use moisture from sauces and slow cooking to add to the tenderness when cooking your roast. 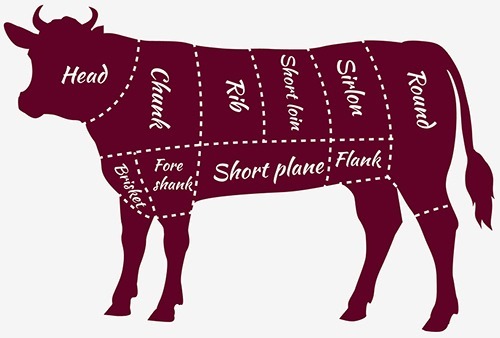 Let It Rest – Whether roasting or grilling, let the beef sit for 8 to 10 minutes for steaks and 15-20 minutes for roasts after removing from heat to let the juices redistribute.